Center of interest – that is the area that I would like you to look at in a drawing or painting. Put another way, it attracts your attention. Greetings! And, here we are at day 21 of #30paintingsin30days! Add to that the ninth cappuccino study! Is it getting to feel routine to you? It is a bit to me. However, I think appearances can sometimes be misleading. Or, at least there are subtle difference. What I mean to say is that there are some differences in the painting today. Immediately, you may notice that this is a mainly orange colored painting rather than the blue dominated pieces I’ve been showing. I had to change my color emphasis; don’t want to get into too much of a rut. Also, I have been thinking that I need to purposely stretch my composition skills. One area I think that I don’t pay enough attention to is the design’s “center of interest” or emphasis. So, time to give it some thought. 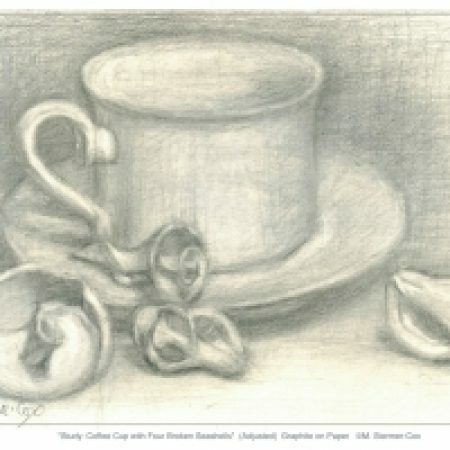 Since the series is about cappuccino, it seemed like a good idea to emphasize the cup. How to create a center of interest might be the natural next question. In this case, I created contrast in color: a light blue surrounded by its compliment of orangish color. You might notice that the rest of the painting only has touches or hints of blue. The other device that I used was to “glaze”, or paint a thin coat of transparent orange over most of the rest of the painting. To elaborate, the orange glaze unifies the other parts of the painting. Plus, it reduces contrast. So, there we are, “Cappuccino V9” in orange. Pumpkin cappuccino, do you figure? References for further reading on composition. Sophia: Design in Art: Emphasis, Variety and Unity. Blue! Day 20: Espresso Time-R V2; #30paintingsin30days	Surprise! Frothing Pitcher & Espresso Cups; Day 22 of #30paintingsin30days Challenge. I find the composition intriguing. Your description of the process is much appreciated. As artists, we usually spend many hours alone with our decision-making, and it is supportive to hear your mental machinations as you proceeded. Thank you! Hi Laurelle, thank you for stopping by! I am happy to know that you found my words supportive. Indeed, being alone working can be wonderful, but also isolating. Its good to be able to share experiences! Again, thank you!